Upgrade your kitchen with style and performance. Slide this range into any decor for a professional look that fits in as well as it functions. The centrepiece of your kitchen boasts a Quick-Clean black ceramic glass cooktop, streamlined digital dashboard with easy-grip die cast knobs, and a large glass door that creates the perfect window for your delicious dishes. Mealtimes are made easy with the intuitive Guiding Light display system. It provides intelligent guidance at every step by only activating the functions and buttons you need. This Marathon 24" wide contemporary style electric range features 2-6" and 2 Fast Heating 8" coil burner elements with porcelain burner bowls and a durable stainless steel handle. Bake or Boil in the spacious 2.7 cu.ft. 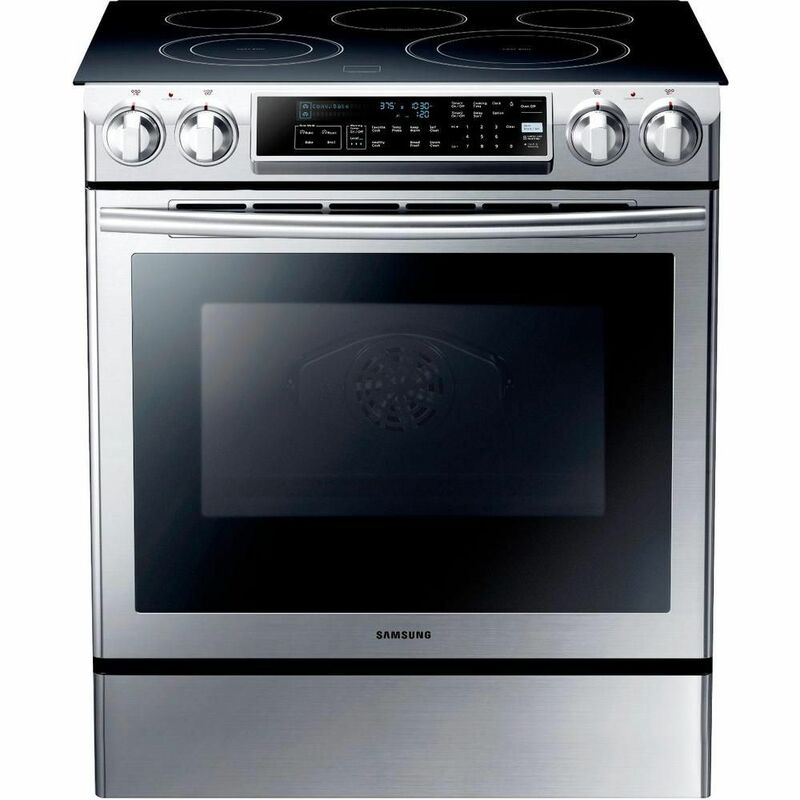 easy clean oven with up-swept porcelain lift-up cooktop. Convenient appliance outlet, slide-out storage drawer and removable large glass door for easy cleaning. All Marathon appliances are "Engineered to Perform" and are backed by the Industry's Best 2 Year Parts and Labour Warranty. 5.8 cu. ft. Slide-in Electric Range with Dual Convection System in Stainless Steel Upgrade your kitchen with style and performance. Slide this range into any decor for a professional look that fits in as well as it functions. The centrepiece of your kitchen boasts a Quick-Clean black ceramic glass cooktop, streamlined digital dashboard with easy-grip die cast knobs, and a large glass door that creates the perfect window for your delicious dishes. Mealtimes are made easy with the intuitive Guiding Light display system. It provides intelligent guidance at every step by only activating the functions and buttons you need. 5.8 cu. ft. Slide-in Electric Range with Dual Convection System in Stainless Steel is rated 4.2 out of 5 by 311. Rated 1 out of 5 by KP from Worst stove ever! Knobs are sensitive and will turn on if anyone leans on it. Glass top cracked... Worst stove ever! Knobs are sensitive and will turn on if anyone leans on it. Glass top cracked in less than a year. Difficult to change heat settings, doesn't matter if it is on high or low it cooks on high. Terrible product! Beware! Rated 5 out of 5 by HI74 from Excellent oven I just purchased this oven and its better than excpeted. I highly reccomend this product and I raelly like. Rated 1 out of 5 by Torri B from Oven drops 35 degrees when you open the door We were so excited about our new stove but the oven doesn't heat properly, won't retain heat and doesn't cook properly. We looked it up and this is a known problem for this model back to 2010. Samsung, I'm so dispointed and won't be buying anymore Samsung appliances. I shouldn't be having a repair call when the oven has only been used 3 times! Rated 5 out of 5 by GotItFixed from We like it We purchased in Nov, 2018 and have used for a few months now. We do like this stove. Great features and works well. The only complaint we have is the knobs are in front, and it is easy to lean over the range to do something, and bump a knob and turn on a burner without realizing it. This happened when I was installing an range hood. Rated 2 out of 5 by Jeffrey from Ordered power cords for this and dishwasher. Home Depot did... Ordered power cords for this and dishwasher. Home Depot did not deliver with appliances. Rated 4 out of 5 by Candy8 from Great features!! I bought this last month and I'm surprised because the cooktop heats up very quickly and the appearance is great. Rated 2 out of 5 by George from The delivery men were the problem: they had no level... The delivery men were the problem: they had no level to be sure it was installed properly; they did not install the back filler plate; they left screws in condo hallway; and took some of the wrapping tape and stuck it to the hallway wallpaper.Please contact me! Stove not as hot as my Kenmore. Rated 5 out of 5 by Melissa from We are very happy with our purchase of this slide... We are very happy with our purchase of this slide in oven. One thing that is necessary is the 1/2 “ overhang that fits over the counter! One thing that could have been better was longer extender feet. I guess our counters measure a little tall and we had to add wood under so it fit.